That is the only word that was running through my head as I finished reading The Shoemaker’s Wife. I did not expect to feel as much as I did. This book grabbed me from the very first word and wove its way through my heart. Ciro and Ezra grew up in villages just a few miles from each other and yet never met. Ciro and his brother are raised by nuns after their father dies in a mine accident in America and their mother is unable to care for them. Ezra grows up on the mountainside, taking on more responsibility than she is asked, growing up faster than the rest of her siblings. Their first meeting is filled with such sweetness in such a sorrowful moment that I couldn’t help but wish for them. Both end up going to America; Ciro is to become a shoemaker’s apprentice after being banished from the mountain and Ezra is going so she and her father can make more money in order to build their dream home. Ciro and Ezra run into each other in New York, but once again, life has different plans for them. Throughout the entire novel, my heart was with these two. There were so many chances, so many opportunities for these two to get together, but their timing was just never right. Their paths crossed, but didn’t entwine. By the end of the novel, tears were running down my face. I simply cannot think of powerful enough words to describe how much this book touched me. Trigiani pulled me right in and I fell in love. Ezra and Ciro had such a perfectly imperfect, sweet, wonderful, powerful, all-consuming love for each other that it was almost as if I could reach into the novel and touch it. 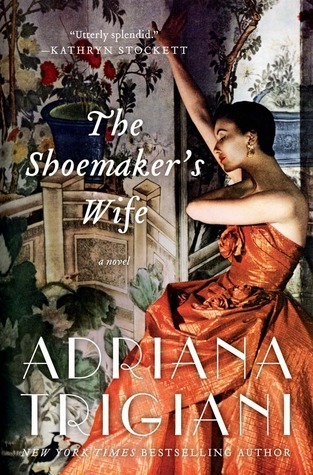 The Shoemaker’s Wife will grab your heart and make you cry with how amazing it is. I truly do not have the words to say how much I love and adore this book. This entry was posted in Contemporary, Historical Fiction, The Must Reads and tagged Adriana Trigiani, Contemporary, Historical Fiction, Must-Reads, Seriously...You Must Read This.